Check out all of our other listings! All of these costs are included in what you are paying. Description: Here’s a never before seen rarity! Canoe Races of the World, or C. Is a beloved annual Cast Member event that dates back to 1973 at Walt Disney World and 1963 at Disneyland. Each year around 80 teams (each with 10 members) competed in pre-dawn races. Amid shouts of ROW, ROW, ROW, the teams put their strength behind the oars to earn the fastest times around Tom Sawyers Island. The best times clock in at around five minutes. This pin was given to participants in Walt Disney Worlds 2014 event that was themed to Star Wars. 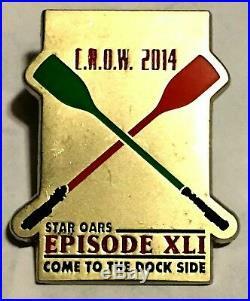 As you can see on the pin the “Oars” are themed as red and green “Light Sabers”, and the pin reads “Star Oars, Episode XLI, Come To The Dock Side”. Year of Release: 2014. Where Released: Walt Disney World. Traders Having This Pin: 1. Traders Wanting This Pin: 10. Backer Card: Never Came On A Card. Edition Type/Size: Unknown Edition Size. Please read all information below! Any failure to follow these guidelines results in ALL liability being borne by the purchaser. The item “Walt Disney World 2014 Canoe Races Of the World (C. R. O. W.) Pin (Star Wars Theme)” is in sale since Saturday, February 10, 2018. This item is in the category “Collectibles\Disneyana\Contemporary (1968-Now)\Pins, Patches & Buttons\Cast Member Exclusives”. The seller is “hidden_walt” and is located in Orlando, Florida. This item can be shipped to United States, all countries in Europe, all countries in continental Asia, Canada, Australia, South africa, Mexico, New Zealand, Brazil, Chile, Colombia, Costa rica, Panama, Trinidad and tobago, Guatemala, El salvador, Honduras, Jamaica, Bahamas, Uruguay, Peru. This entry was posted in walt and tagged canoe, disney, races, star, theme, walt, wars, world. Bookmark the permalink.